In trading price bars, sometimes an exhaustion gap is followed immediately by a breakaway gap going in the other direction. When this situation occurs, it creates an island reversal in the price bar chart. 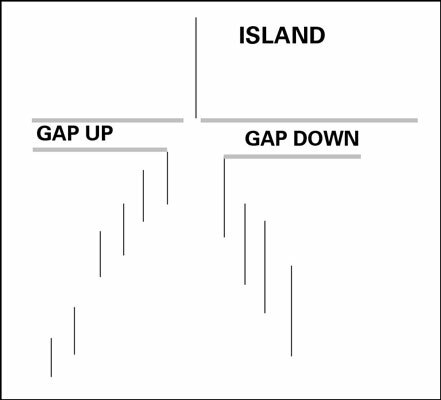 An island reversal is a single, isolated price bar with a gap up on one side and a gap down on the other. It looks like an island in a sea of price bars and is almost always an unusually long bar — a wide high-low range. This figure shows a series of higher highs, including a minor gap up, but then the last buyers realize that they are all alone on top of the mountain. They start to sell in a panic and are willing to accept a much lower price. Now the price takes off in the opposite direction on a breakaway gap. Watching volume can get a little tricky. The island reversal bar has a higher high but is accompanied by low volume. This combination is the warning. The next day, as the breakaway gap develops, it has unusually high volume. High volume in combination with the downward gap is an indication that early selling is strong and prices later in the day aren’t going to go back and fill that gap. An island reversal at the bottom: Buy. An island reversal at the top: Sell. Despite its rarity, chances are good that a large number of other people will identify the makings of an island, too, and cause the expected reaction — the self-fulfilling prophecy aspect of technical analysis.